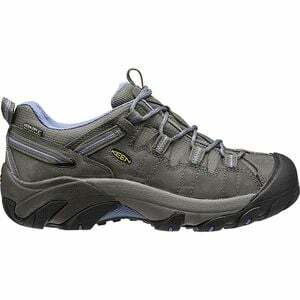 Product Condition: The Targhee II Waterproof Hiking Shoe - Women's is in Excellent condition. These sandals were previously owned for three weeks. The following observations were made regarding these item. *They were tried on in indoors for an occasion. *There aren't any defects in them at all. *They got minor dirty/dust, cleanable. *All items sold as is, all warranties void. Try out a refreshing new day hike in the Keen Women's Targhee II Hiking Shoes. They'll keep your feet dry with waterproof breathable eVENT inserts as you stomp through puddles. The full-length ESS shank and S3 Heel Support Structure provide great stability on those super steep sections, and the Secure-fit Lace Capture System keeps your laces nice and tight.